The last few months I’ve been reading The Long Tail by Chris Anderson. Today, I’m reading a book called Social Intelligence, The New Science of Human Relationships by Daniel Goleman. This book is from the author who wrote about emotional intelligence, but the angle that interests me is how our daily encounters on the web and in real-life affects the cells in our bodies down to the level of our genes and then back up to our emotional level. Daniel’s basic discovery is that we humans are designed for sociability and that we are constantly engaged in a neural dance to connect ourselves brain-to-brain with others around us. This book was acquired thanks to a small gift from Yanik Silver… who sent me an Amazon gift certificate for being a guest in his 6 hour teleseminar last week (thanks Yanik!). I wonder if this book will explain why social networking is so powerful and that I’ll be able to apply some of the lessons here with our websites. Those who know me, know that this book is outside of my comfort zone and that’s exactly why I wanted to read it. 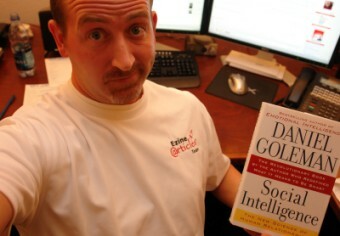 If you’ve read Social Intelligence, I’d be curious to hear your thoughts on the book? Okay, Chris, you’ve convinced me, i’m ordering it today! I am a big fan of Goleman and have his other books, but like you, I wonder about being in the ‘real world’ so little these days. I enjoy being behind the computer and with my online connections too much. I also just bought Tim Rath’s Vital Friends which also addresses the necessity for face-to-face contacts. All good stuff. It would be interesting to see what types of things you add to the site based on that book. Also what sorts of things you recommend as you better understand the reader and viewers of the articles. It will be interesting to see what EzineArticles can take from that book and do with some of the great insight in understanding the reader and social needs of the masses, as they relate to this website. I will look forward to seeing that. It is great to see that the top online article directory entrepreneur is constantly reading and learning to take this site to the next level. That is a sign of a strong leader who is fully engaged in the objective of winning for all the team including the vendors, authors, readers, advertisers and future team members too. I think your choice of books makes a lot of sense, this is another great title that should indeed be on people’s reading list. I’m very glad to see you find meaning in the well intended advice of others and you may be expanding your comfort zone further into sociology. Odds are you will find meaning many would miss and I see this thread growing very long as you begin to share what you are learning and those who have read this book or have begun, add comments. From what I am reading and observing lately, social skills and networking may be necessary to personal survival on a global scale. You just gotta like a CEO that wears a t-shirt to work. Are those available to us Chris? And I have shorts on, but you can’t see it. I’m way more productive when I’m comfortable in what I’m wearing, so I’ll be wearing shorts and a nice quality t-shirt right on through Winter (my computers warm my office up enough to keep me warm). The T-shirt you see me wearing is a new limited run “EzineArticles Team” shirt that we had printed for the group photo that is scheduled for next month. I wanted a dri-fit or coolmax or one of those high-tech moisture wicking away shirt fabrics, but this shirt is a Port Authority Sport-Tek shirt and it’s too see-through for work, so we’ll be trying different brands next to find one. As soon as I’m happy with the quality of the shirts, we may send them or sell them to a limited group, but no plans at this time. Social Intelligence sounds like a good book for those house, computer and social hermits that do not understand how to apply social intelligence and skills for a happy, healthy and balanced mind, body & soul. Than again, I have known ever since I was a kid that social intelligence was needed to co exist in a sometimes narrow minded closed society and a good skill to have in order to convince others to get things done. Consequently, my social intelligence is superior and that is why I have what I want, need and desire. Have a great day. Chris, outfit your team to model performance , professionalism, comfort and style ‚¬€ all day long comfort in a great lightweight, long-wearing Optimal Performance Qwik Wick shirt. Your wants for the right team shirt have been met! Your team will take productivity to a new high in a comfortable, high-tech moisture wicking away shirt made from the special Quick Wick Fabric – an anitmicrobial fabric that has superior moisture management properties and dries faster than competitive fabrics. Savvy socializers love this ‘never-let-’em-see-you-sweat’ quiality in a shirt ‚¬€ the Ciba TINOSAN anitmicrobial fabric makes sure that a Classic Golf Shirt (all round shirt for office, client meetings and casual wear) is fresh feeling and comfortable every time you wear it. Personalization and bulk purchase discounts are available. Carl and Janet just showed us all some great ad copy except they leave us guessing as to where we might find this fantastic product without doing a search. Perhaps only the true seeker is worthy to own such quality. An easily discovered and learned usability design feature on the Ezine @rticles Blog is that by scrolling over the clicking on the underlined name(s) of the person(s) who make a comment – you are routed to the person(s) website.You will end up on the fantastic (shirt) product site by scrolling over and clicking on the underlined Carl and Janet Chesal shown at the beginning of our comment. Carl and Janet, that’s quite a comment. You see an opportunity and you went right for it. Except this is a blog, not craigslist.